The Rev. 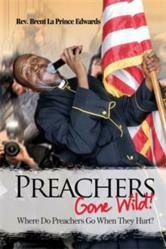 Brent La Prince Edwards’ book, ‘Preachers Gone Wild! Where Do Preachers Go When They Hurt?’ is a shot in the arm to all evangelical churches in America and worldwide. Being a minister is quite a challenge and many clergy find themselves leading while bleeding often with little or no place to vent while still having to carry out the duties of ministry. Thus, his book advocates a deeper and stronger base for all ministers and preachers the better to keep congregations, pulpit and pew, together and also emphasizes the power of prevention to keep preachers from falling and how to recover should they fall. Edwards has translated his deep love and respect for his audience into an uncanny ability to connect and further, with fortitude and compassion has lived a life of service to people, especially those trapped in substance abuse, the homeless, and the marginalized. With his book, Edwards has encapsulated his methods and passion for the holistic health of clergy everywhere and also to all whose vocations places them under the scrutiny of the public eye. The author emphasizes that all things should be done with humor. With humor and with time out to take off the collar and rap person to person with other preachers, ministers may turn back to the basic principles of service, to reach this generation and bring back dignity to the pulpit. This book also emphasizes healthy pulpits make healthy pews and when this becomes a reality global evangelism and healing can begin. For more information on this book, interested parties may log on to http://www.Xlibris.com. The Reverend Brent La Prince Edwards is an ordained, anointed, profound and sought after speaker who travels extensively addressing various topics of interest crossing denominational lines, cultures, and boundaries. He has served as a guest on both national and international platforms. He is the senior pastor of the historic St. James Africa Methodist Episcopal Church, Asheville, North Carolina, and the founder of the Helping Hands Community Youth Development Center, Inc., Mt. Gilead, North Carolina. Reverend Edwards is the second son of the honorable Mr. and Mrs. James and Gloria La Prince Edwards and currently resides in North Carolina. Where Do Preachers Go When They Hurt? For more information on self-publishing or marketing with Xlibris, visit http://www.Xlibris.com. To receive a free publishing guide, please call (888) 795-4274.